Ted Farmer is planning to honour the memory of some of his Wolves team-mates and predecessors by raising money for dementia charities. 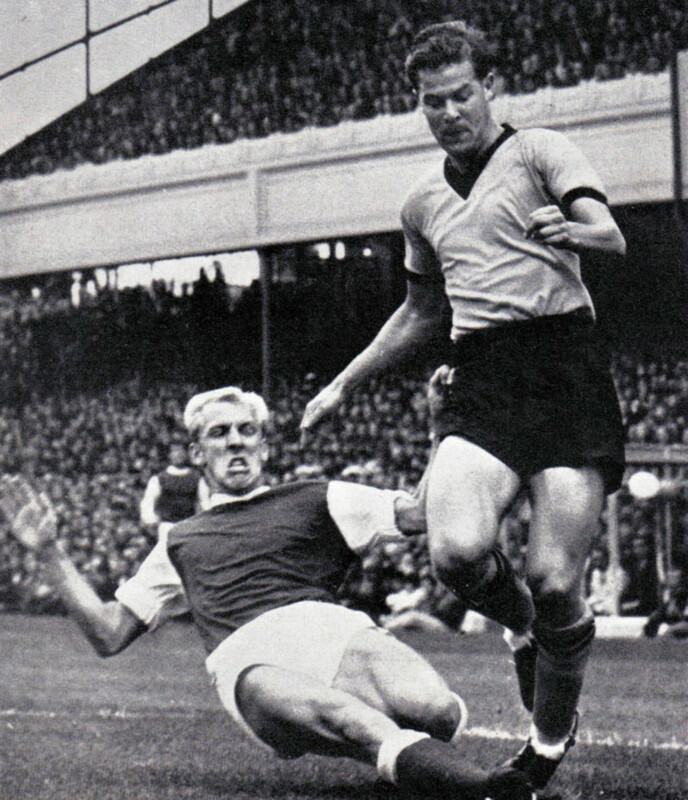 Ted Farmer takes on Ian Ure during Wolves’ game against Billy Wright’s Arsenal on the opening day of 1963-64. With depressing regularity, the Molineux family have learned over the last few years of ex-Wolves players being inflicted by memory problems. Now Farmer hopes to do his bit and ensure the condition is kept in the public’s consciousness in the same way that other illnesses are. “We have heard of so many great Wolves players having Alzheimer’s or similar problems,” he said today. “The fans will be able to name them as well as I can…..Roy Swinbourne, Barry Stobart, Sammy Smyth, Bill Slater, Bill Shorthouse. “My mate Les Cocker, who played in the side when we neat Chelsea in the FA Youth Cup final, is another one. “We seem to hear lots about Cancer Research and charities connected to diseases like that but memory-related problems are very much part of life now, probably as much with footballers as anyone. We at Wolves Heroes have pledged to do what we can to help a man whose own playing career was cruelly cut down by injury after a sensational arrival in first-team football. And it sounds like he may be busy with a few personal appearances over the coming months. “I still have 200-300 copies of my autobiography left and doing nothing here,” he added. “Not long before John Hendley died, I was talking to him and discussing what I might do with them. “What I would like to do is go along to a few supporters’ nights or maybe a match day or two and hand them over to fans in return for a donation. “I did well with the book when it came out in 1987 but remember having another thousand printed when Wolves reached the Sherpa Van Trophy final and they didn’t do anything like as well. What can be guaranteed is that anyone who splashes out for a copy of The Heartbreak Game will be in for an interesting read. Farmer, who had a handsome array of former colleagues – plus the Central TV cameras – at his book launch at the Goldthorn Hotel in Wolverhampton, proved himself to be a very forthright author. 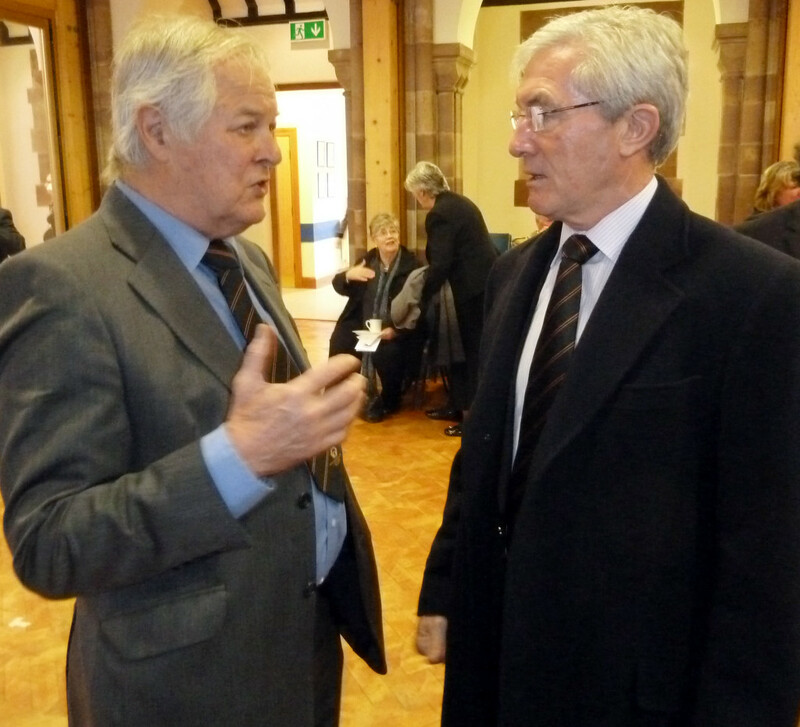 Ted with Wolves Heroes’ John Richards at the funeral of Roy Swinbourne three years ago. If any of our readers wish to support this money-raising effort, please email us and we will be happy to make the appropriate introductions. Posted on: Sunday, February 10th, 2019.